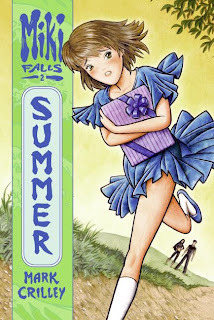 This second installment of the four-volume manga series Miki Falls picks up where the first volume left off. Hiro and Miki have become friends, even though Hiro's "superiors" have forbidden him to fraternize with regular humans (he has chosen to become a Deliverer, a sort of otherworldly person who has certain mysterious abilities that have to do with relationships and love). Miki is happy to spend time with him, and she's fascinated by his work. She is amazed to witness the complexities of romantic relationships, and she is surprised to find that even apparently happy couples often have serious issues. Her own relationship with Hiro becomes complicated when she discovers him with another Deliverer, who is beautiful and rather hostile toward Miki. Later, Miki sneaks a look at Hiro's relationship book and finds that Yumi, her best friend, is having boyfriend trouble. There must be something Miki can do to stop her friend's relationship from falling to pieces. Miki is faced with tough decisions in this volume, and she makes some poor choices and has to live with the consequences. But she is smart and kind, and she doesn't give up - she learns from her mistakes and carries on the best she can, which is what makes her such an engaging heroine. The book maintains such a tight focus on Miki's relationship with Hiro that it excludes secondary characters almost too much. The plot line involving Yumi and her boyfriend, for example, would have been more powerful had we been able to see the couple happy together, engaged in some activity or conversation, so that we would share some of Miki's concern for them. I hope we'll get to see more of these other characters a bit more in the next volume of the story. I enjoyed this volume very much, and I am looking forward to following Miki's adventures in the next season of her series, Autumn. Manga Life: "...a love story at heart. But more than that, it’s a story about personal sacrifice and of what people will do, and the means they’ll use, to ensure that they bring about paths of happiness for themselves and their friends." I love the fact that each book is named after a season! Like I said last time, this sounds like a series I'd really enjoy. Me, too. Maybe someone should start an online manga-style clothes shop. Actually there probably is one already! Thanks for your detailed feedback in this review, Darla. I think you're right about the readers not knowing quite enough about Yumi and her boyfriend to care about them as deeply as Miki does--if only I could go back and rewrite that part! Thanks again for your support, Darla: You're the best! Mark - You are very welcome! Thanks for writing such wonderful books. The public library where I work has chosen Miki Falls as one of our summer reading picks, and it's going to be fun to book-talk it to the kids at the end of the school year. I have Autumn on my book pile, and I'm looking forward to reading it soon. "The public library where I work has chosen Miki Falls as one of our summer reading picks"
Wow that's great! Please tell the librarian I said thanks! And thanks in advance for reading Miki Falls: Autumn. Though I'm sad to say you won't learn much more about Yumi for the rest of the series, I do believe the third book is where Miki Falls really starts to surprise its readers--it sort of opens up into a much bigger story.